Deep in the jungle of Central Java, Indonesia, a bird-shaped building called Bukit Rhema stands tall above the treetops. Built in 1992 by Daniel Alamsjah, a Christian who claimed his work was inspired by a vision from God, the structure is not technically a church, but a "prayer house for all nations," according to its official website. 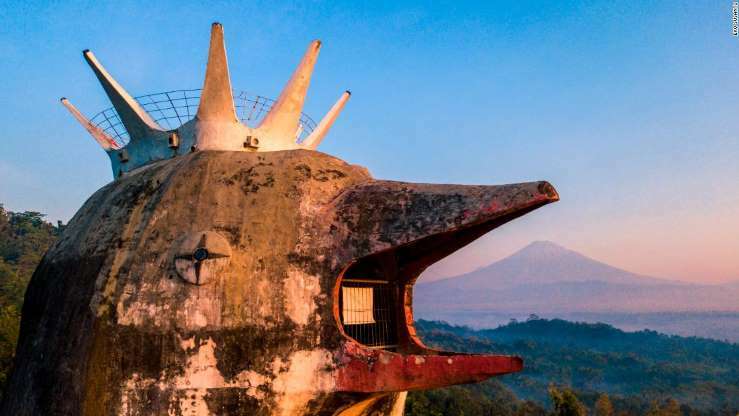 However, to almost everyone -- including Werner Herzog, who featured the building in his 2016 documentary "Into the Volcano" -- it is simply known as gereja ayam, or "Chicken Church." The vast differences between these two buildings is illustrative of the diversity found across Indonesia's ecclesiastical architecture. Ranging in influence from traditional Indonesian design to Western movements like Art Deco and neoclassicism, they not only tell the story of Indonesia's relationship with Christianity but also of its centuries-old fate as a colonized nation. Indonesia is the world's most populous Muslim country, with more than 82% of its roughly 260 million people following Islam. Around 10% of the population are Christian. Like most of Indonesia's early Christian buildings, Jakarta's Sion Church was built by Dutch colonialists. Constructed in the late 17th century for Portuguese slaves who had been converted to Protestantism, it is now the Indonesian capital's oldest surviving church. Wide and rectangular, the church's hall was built on top of 10,000 wooden logs. One of its most striking features is a Baroque-style wooden canopy (known as a baldachin), reminiscent of the one found in St. Peter's Basilica in the Vatican. "It was a modest baldachin -- they didn't have the resources to make a lavish one," said Mohammad Nanda Widyarta, a University of Indonesia lecturer specializing in architectural history, in a phone interview. "After ... the cultivation system policy in the 19th century (in which the Dutch forced farmers to produce crops for export), the Dutch East Indies had become a fragile place. What they had in mind then was a more capitalistic colony, so Indonesia at that time, especially Jakarta, was becoming more modern. Investors started rolling in. It was at this time that architectural styles became a point of interest." Dutch Protestantism loomed large in Indonesia, with missionary societies helping to spread the religion across its many thousands of islands. Although Christianity was never able to challenge the dominance of Islam, which arrived in the region during the 14th century, the colonists left their mark on the country's architecture -- and not just of churches themselves. "From hospitals to universities, some of the architectural styles ... bear European traces, like neo-classical, neo-gothic and eclecticism," Widyarta said. The influence of neo-classicism is especially evident in Jakarta's Immanuel Church, which King William I of the Netherlands had hoped could unite the various branches of Protestantism in the country at the time. Known by the Dutch name Willemskerk upon its completion in 1839, the building's design features tall Tuscan-style pillars and a pediment reminiscent of classical Greek architecture. A huge dome emerges from the center of the structure, its roof lantern etched with lotus flowers. If Jakarta's Chicken Church was home to Indonesian Christians, then Immanuel Church was for the Dutch elite. Comparing the two buildings' architecture speaks volumes about this dichotomy, with the opulence of the latter clearly contrasting with the modesty of the former. The building was designed by J.H. Horst, who had "no prior pedigree in architecture," according to the executive director of Indonesia's Documentation Center of Architecture (PDA), Nadia Purwestri. At the time, formally trained architects were rare, with most of Jakarta's buildings designed by the Dutch military's engineering arm. Horst was inspired by Greek-style temples and other European designs that were en vogue at that time. But he made a number of adjustments to make the building suitable for Indonesia's tropical climate. Eaves, a typical feature of Asian architecture, were installed to channel rainwater away from the roof and increase the amount of shade at ground level. By the late 19th century, the idea of fusing local and Western designs had developed into a unique architectural movement known as New Indies Style. The style is characterized by European designs that have been adjusted for the Indonesian climate. Architects, both local and foreign, who had trained in Europe started bringing new ideas to Asia, and the profession flourished. "Most of the designers brought here what they saw in Europe," said Purwestri. While this fusion of East and West is most evident in Jakarta, there are signs of it elsewhere in the country. At East Java's Pohsarang Church, for instance, Dutch architect Henri Maclaine Pont used Western construction methods while eschewing common neo-gothic tropes -- like the tall spires and pointed features of Jakarta's Cathedral -- in favor of Javanese ideas. Built in the 1930s, the church draws on the traditions of local houses, which Pont thought had all the trappings of modern architecture, such as tent-like tensile structures and the heavy use of stone. The variance found among Indonesia's churches is testament to the cultural melting pot that the country has become. Purwestri argues that, even if the Dutch hadn't colonized the archipelago, its architecture would still be similarly varied. "I think they'd look just as diverse," she said. "Foreign nations in the 16th or the 17th century came to Indonesia with the purpose to trade while spreading the Christian belief. They didn't have a model to build their churches after, because Christianity was rather new. So they built them the same they do back home. "If we had not been colonized, European influences would still have been there since there were priests or nuns or missionaries who came here." Yet for Widyarta, the buildings cannot be separated from their colonial past. "If we had not been colonized, we perhaps wouldn't have had the Immanuel Church or the Chicken Church or the Pohsarang Church," he said. "We wouldn't probably have Indonesia as it is today."